You are here: Home / News-o / Blog / What Can Managed Network Services Do for You? Global demand for managed network services is growing. It offers security and scalability at prices that in-house infrastructure simply cannot match. For all but the very largest of organizations, the cost of building in-house network infrastructure far outweighs the potential benefits over leasing the network as a service. This is especially true for organizations that can’t rely on always having predictable network traffic needs. Scalability is an important feature of the managed network services platform. 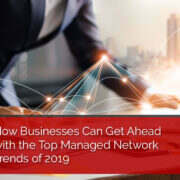 Not only does it enable enterprises networks to respond to differing traffic needs, but it also makes upgrading to new network technologies much easier. Without a managed network services provider performing the work, an enterprise would have to rip and replace its entire network infrastructure on a regular basis to keep up with new developments. This is unfeasible, so many in-house networks remain in use far beyond their useful life. Network service is an area where contracting an IT managed services vendor can provide enormous value over time. Unlike in-house networking, an enterprise-level organization can consistently access the latest technologies on the market. Enterprises that rely on managed service vendors for network services can implement more sophisticated technologies than similarly sized competitors. They are also able to upgrade their infrastructure more frequently and more safely than their large size would otherwise indicate. This is incredibly important in the world of networking technology, as new frameworks and solutions enter the market at a quickening pace. With modern approaches like software-defined wide-area networks (SD-WAN) making increasing headway in the world of enterprise business, the need to avoid obsolescence is more crucial than ever. This is especially true for large organizations that often need to combine multiple types of network connection types into a single, manageable framework. SD-WAN is one of the most promising approaches to treating a long list of network services like a single, unified network. SD-WAN extends software-defined network architecture to cover wide areas. Software-defined networks are already popular in data centers, university campuses, or corporate headquarters – SD-WAN offers the same functionality on a scale measured in hundreds of miles. Whereas software-defined networking is an architecture, SD-WAN is a combined service that you can buy or lease from the appropriate vendor. It provides a clear example of why it’s so important for enterprises to entrust their networks to expert technology providers. Consider an enterprise with multiple regional offices located in different cities or states. Some of these offices are connected through the latest, highest-performance networking technology on the market. Others only have access to commercial-grade Internet connections. SD-WAN technology allows a managed network provider to bundle multiple commercial-grade Internet connections into a single high-bandwidth connection that performs at a speed similar to the most advanced technologies available today. It allows the system administrator to manage the entire network through a single interface. Why Is Managed Network Services Critical to Implementing SD-WAN? SD-WAN is a new technology. As of 2017, it enjoyed a market penetration of only 5%, but Gartner expects it become a $1 billion market by 2020. Implementing SD-WAN requires specialized skill and expertise. The technologies involved are unlike traditional networking technologies that most in-house IT teams are likely to be familiar with. 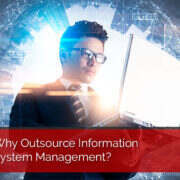 Even for those that are, managing the infrastructure effectively is a costly and time-consuming project. However, once the network is in place, generating new software-defined rules for it is not complicated. This means that companies who specialize in SD-WAN solutions can leverage economies of scale to reduce the operating cost of maintaining their networks. This allows managed network service vendors to install and maintain SD-WAN solutions in a more cost-effective manner than any single organization could using in-house resources. It demonstrates that IT managed services are far more efficient when applied at scale and then partitioned out to partner organizations. Even then, SD-WAN comes with far lower costs than traditional wide-area networking. Whether implemented through commodity infrastructures or hybrid hardware/software solutions, overall costs can be less than half what a traditional wide-area network would require. The problem with in-house infrastructure is that it locks funds and resources into illiquid assets that fail to drive value when it not in use. 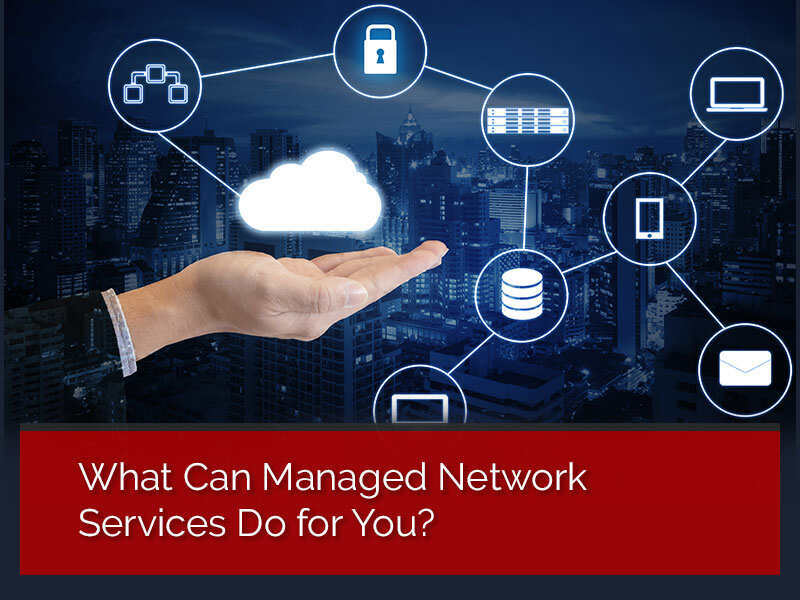 Managed network services allow enterprises to pay for the network infrastructure they use, and to avoid paying for equipment they don’t need. The ability to quickly scale networking needs up or down makes it unnecessary for enterprises to maintain their own networks. Managed services offer time and capital savings far in excess of their costs. Find out just how much time and money managed network services can really save your office. Talk to one of our Solutions Specialist today! 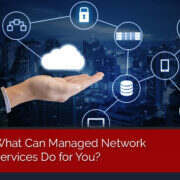 https://www.smilebpi.com/wp-content/uploads/2019/01/What-Can-Managed-Network-Services-Do-for-You.jpg 600 800 Patsy https://www.smilebpi.com/wp-content/uploads/2018/11/smile-logo6.png Patsy2019-01-02 10:37:472019-01-02 10:41:00What Can Managed Network Services Do for You? How Can I Protect My Business From Crypto Miner Malware Attacks? How Can Managed Network Services Protect My Company from Malware Attacks? What is Betabot and Why Does Your Company Need to Be Protected From It? 5 Ways to Make an Office More Environmentally Friendly Is PaperCut Right for Your Sharp Devices? It Sure is!